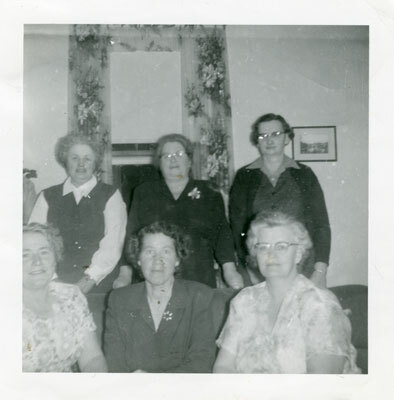 This black and white photo shows six members of the Iron Bridge Women's Institute taken in approximately 1955. The photo shows three members sitting, and three women standing. The photo appears to have been taken inside someone's home. Back Row: (Left to Right) Mrs. Mary Bass, Mrs. Evelyn Grigg (Forrest) Mrs. Irene Moise (Spooner). Front Row (Left to Right) Mrs. Katie Draper (Fraser), Mrs. Jean Eaket (Stobie), Mrs. Margaret Inkster (Ingram).